Hi bloggers and blog readers! 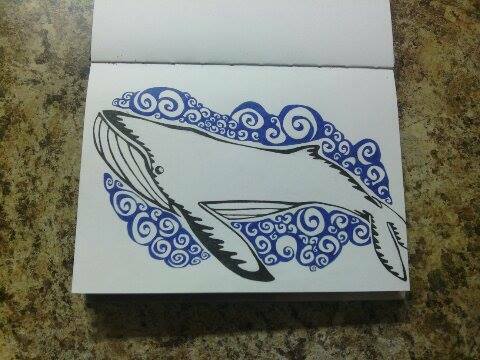 Some of you might remember earlier in the month that I posted a sketch of a whale. I finally finished it, or at least got to a point that I am happy with. Using a regular pencil to draw this out and some micron pens to color it, I created this beauty. I wish that I had enough space to finish the tail. There’s nothing to do about that now I guess. I modeled this piece off of a sperm whale, though now I do not think that it looks very similar to one. That’s no big deal though. I am very happy with how this piece has come along. This is fantastic!! It would such a cute t-shirt design. Aww, thanks! That would be awesome if I could make it a t-shirt design! Oh cool! I’ll look into them! Thanks!